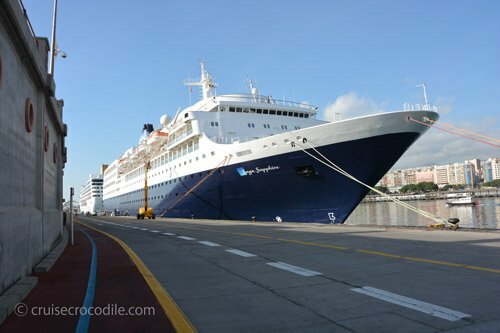 Our Santa Cruz de Tenerife cruise port guide gives you information about the docking location, cruise dock, transportation options and much more! Welcome to the Santa Cruz Cruise Port Guide. Santa Cruz de Tenerife is a city of about 200.000 on the island of Tenerife, which is part of the Canary islands. In the middle of the Atlantic ocean off the southern coast of Morocco we find a group of islands that make up the Canary islands or Canarias. The 7 main islands all have their own landscape and identity and that makes cruising through the area a delight. Tenerife is the biggest islands and well known for housing Spain’s largest mountain: Mt. Teide. This dormant volcano reaches a height of 3718 meters and that makes it the 3rd largest volcano on earth. Visiting this moon landscape is an absolute delight. Tenerife is more than a volcano hotspot though. There are tuns of little scenic villages that you can visit, you can lay on the beach or simply stay in Santa Cruz. Santa Cruz is a city where old and new meet. On one hand you can find the beautiful modern design architecture, but you will also see its old historical buildings with wooden balconies here. The city has a great vibe and there is plenty to explore here. Read the Santa Cruz cruise port guide for all the information. In Santa Cruz you will find a very long pier where cruise ships can dock. At the pier you will find limited facilities. Only taxis and shore excursion busses are allowed on the pier. 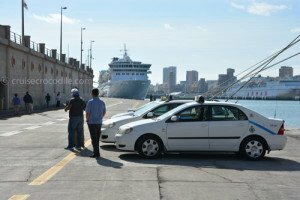 The port usually sends a representative from the tourist information for the first few hours to hand out information and maps. The port shuttle will drop you off at the port terminal. This is a at the foot of the city centre. At Santa Cruz you will find wi-fi at plenty spaces. Find this building at the end of the pier for free wi-fi. The port of Santa Cruz is a large one. 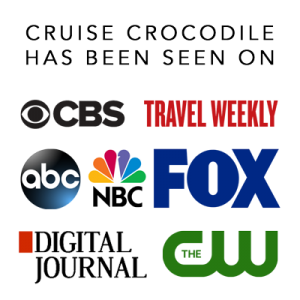 There is a specific area where cruise and passenger ships can come in. Most cruise ships will have to dock on the very long pier as you can see in the map above. Your ship could either be docking at the beginning or at the end of the pier. You can tell how far the walk is to the city centre by checking the blue signs on the wall of the long pier when you exit the ship. Usually the distance to town is between 1000 and 1500 meter. Official taxis in Santa Cruz are white with a small blue stripe and they have a meter. You will find them waiting on the pier for you and also in the city centre. Prices vary and you have to negotiate if you want to go for a taxi tour. Expect that it costs you about 140 euro to hire the taxi for the whole day. There is a hop on hop off bus in Santa Cruz, but it only takes you around town. Find its closest hop on location at the Plaza de Espana. To get to the main bus station you can either walk (2,5 km from port) or pick up the public bus at the Plaza de Espana to Intercambiador (main bus station). In town there are no beaches. If you would like to go to one catch bus 910 to Teresita at the main road in front of the terminal. Teresita beach is the closest beach available with sand that was imported from the Sahara. Although the bus system in Santa Cruz is extensive there is also a tram service you can use. This tram is ideal to take to La Laguna. Find the location of the tram stop on Bravo Murillo street. Buy a ticket for 1,35 euro one way with coins or credit card at the machine at the stop. Tram leaves every 10 minutes. Just a few km’s up from Santa Cruz in the mountains on the horizon is where we find La Laguna. It lies about 480 meter above sea level. It is one of the most important cities on the island and definitely the most charming. It is considered to be the cultural and religious capital of the island. Until 1723 it even was the official capital. Its historical centre is on the UNESCO world heritage list because of its beauty and historical significance. Easy take the tram from the city centre of Santa Cruz to go to La Laguna. El Corte Ingles is the biggest department store group in Europe and ranks fourth worldwide. It has all the big Spanish and International brands under one roof. This shopping mall is huge and paradise for any shopoholic. The port shuttle drops you off here. This cruise terminal marks the exit of the port. From here you walk straight into the city centre. 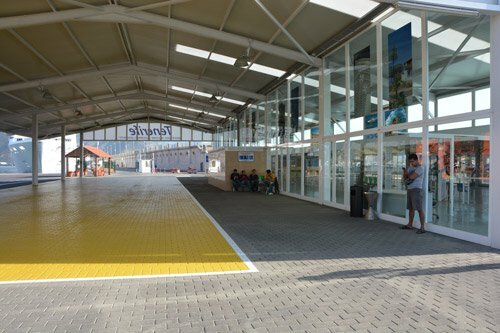 In the cruise terminal you will find limited facilities or interest. You can find a car rental service inside and some souvenir shops. In the Northern part of island we find the Anaga Mountains. Most of Tenerife is dominated by a dessert like landscapes due to its volcanic activity, but in the north is the complete opposite. Find the green areas here that make up the skeleton of the island. Go for a scenic drive through the mountains from village to village. 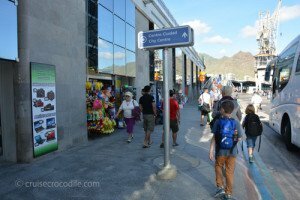 You will find a tourist information point on the Plaza de Espana, which is a few hundred yards from the cruise terminal. They provide great information on what to see and do and all your transportation options. Mt Teide is the highest peak in Spain. It is over 3178 meters high. Visit this incredible volcanic landscape by bus or taxi. Find the park 40 km west of the cruise port. 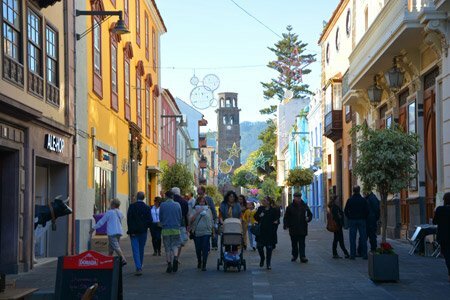 This is the main shopping street of Santa Cruz. Find the big brands and small boutiques here. Planning a day of shopping: your trip should start here. In town there are no beaches, but if you would like to go to one catch bus 910 to Teresita at the main road in front of the cruise terminal. This is the closest beach available with sand that was imported from the Sahara. Find this central market in the middle of town. This prominent building houses the best market in town. Find any local product here. It is not just a market, people also come together here to share a drink or bite. Your ship will dock at the long cruise pier in front of the city of Santa Cruz de Tenerife. Read our cruise port guide for detailed information about the port. This is the bus terminal of Santa Cruz. From here you can take buses all over the island. From port this is about 2,5 km walk or you can take the public bus from Plaza de Espana to Intercambiador (bus station). Double click here for the local bus planner.